A customer asked me to look into an error which showed up in one of their applications. Without going into the details of real use case I like to bring this issue to your attention as it might happen to you too. 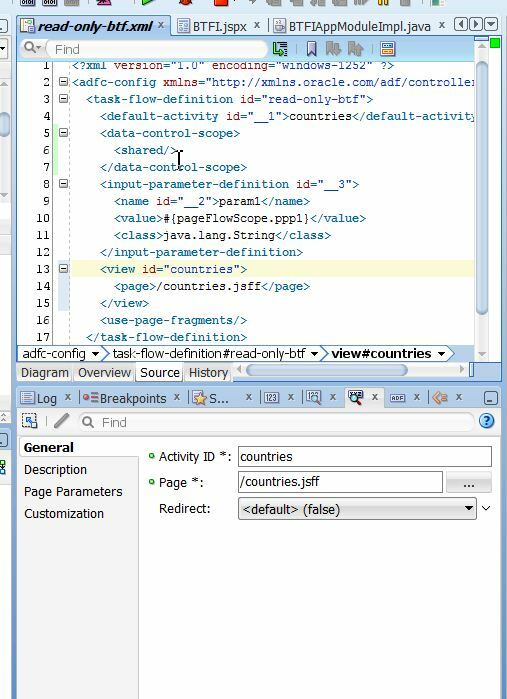 I set up a mock use case to show the problem as this: A page (.jspx or .jsf) includes one (or more) other task flows as a region. The base page retrieves some data using a method call exposed in the data control, which should be displayed in the region for information purpose. If the task flows share their data controls this is not a big deal to implement this. You can download the sample using the link provided at the end of this blog. The sample uses the HR schema and was build using JDev 11.1.1.5.0 and was additional tested with JDev 11.1.1.1.6.0 and JDev 11.1.2.2.0, which show the same behavior. The return value is then displayed on the base page at the bottom under the button and should be displayed in the region, under the table, too. The sample just uses one region. When no value is present ‘****’ is used as parameter. The image below shows the application after starting it. 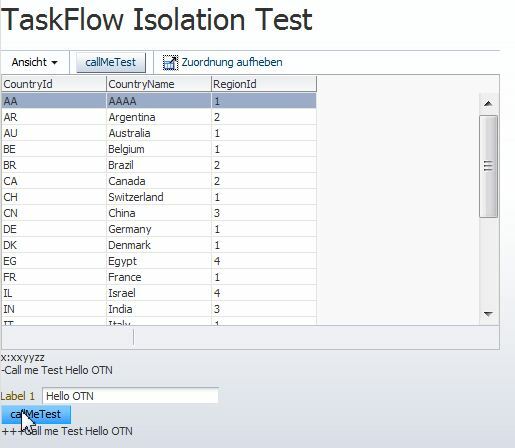 After entering a value into the inputText field below the table and hitting the ‘callMeTest’ button underneath it, you see that the return value is displayed below the button on the base page and under the table inside the region. If the button is hit with another value, both values are updated. Nothing unusual so far. Now, for some unknown reason, after a change to another part the application, that functionality did not work any longer. The value in the base page still updates after the call to the method, but the value in the region stopped updating. The reason for this behavior is a simple one. 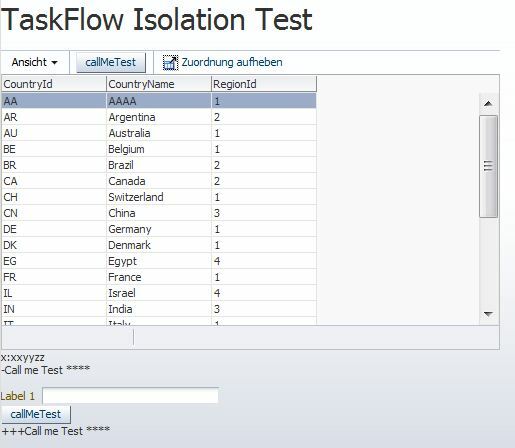 A look into the task flow properties of the region, revealed that the checkmark for the ‘Share data controls with calling task flow’ was not set, meaning that the task flow get its own data control frame. 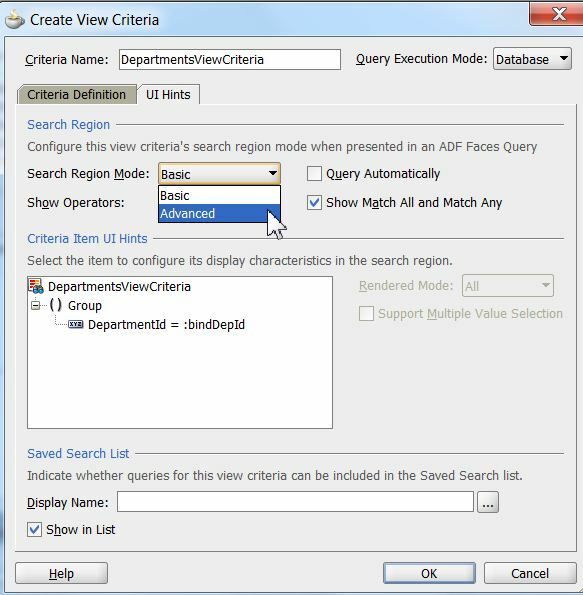 The result is that the method outcome from the base page is not visible in the region. The question was how did this happen, when the change which results in the new deployment had nothing to do with this part of the application? is just missing from the XML file. Once you click on this property in the property editor you can just switch between ‘isolated’ or ‘shared’. 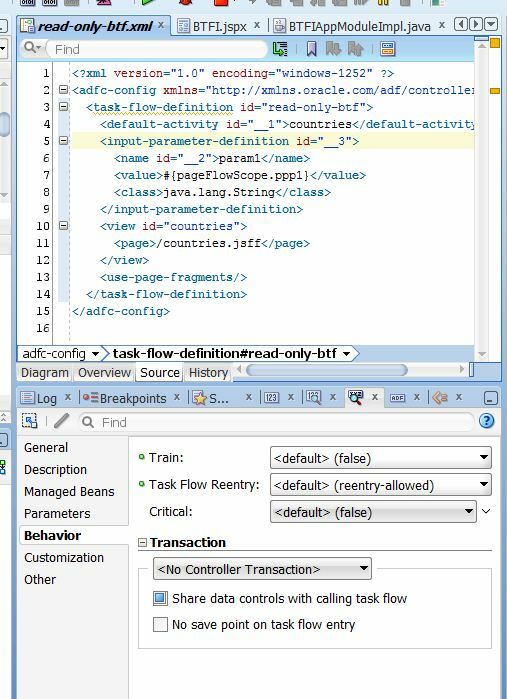 The only possible way to get the bluish shade back is to delete the section in the source view of the task flow. 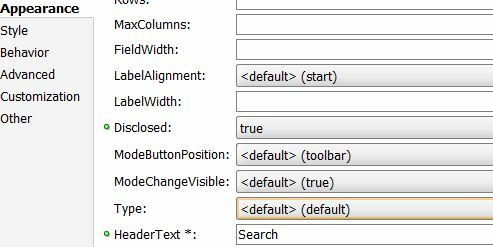 While the application works according to the meaning of the flag, I find it not intuitive how JDev handles this setting. The programmer who made the change to the application clicked this property, but meant to do so on a different task flow. 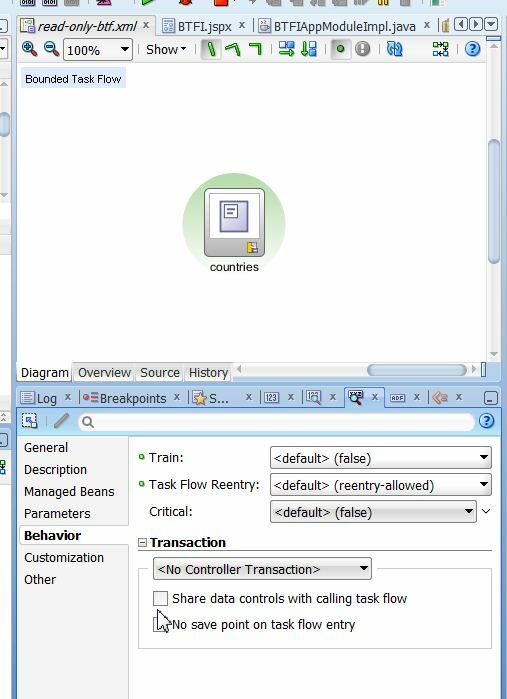 So he unchecked the ‘Share data controls with calling task flow’ property as he remembered that it was not set before. 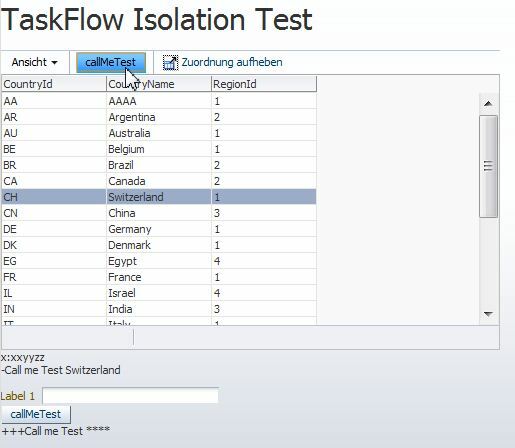 My advise is to set the flag whenever you create a task flow so you know which share mode the task flow uses. This avoids errors like the one described in this blog. In the meantime Chris Muir raised the issue with the UX specialists (Oracle intern) and Bug 14390576 has been raised for this issue. 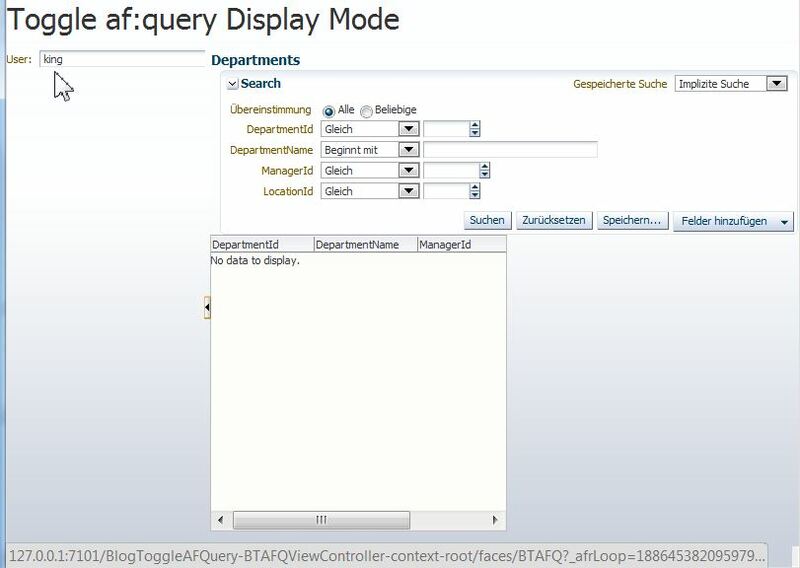 ADF af:query component comes with many functions and layout possibilities. 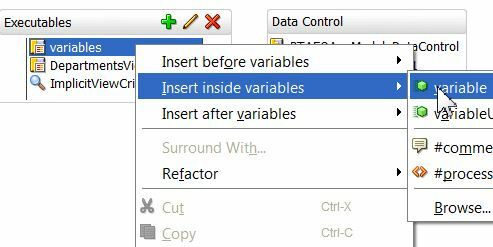 This post describes how to toggle between the ‘basic’ and the ‘advanced’ display mode from java code. Fist lets see the difference between ‘basic’ and ‘advanced’ mode. 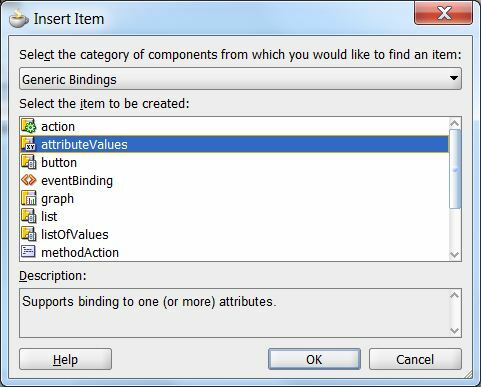 So you either create your own ViewCriteria and select to start in ‘advanced’ or you need to do it from a java bean as described below. The sample application is build using JDeveloper 11.1.1.5.0 and uses the HR schema. The link to download the sample can be found at the end of the post. 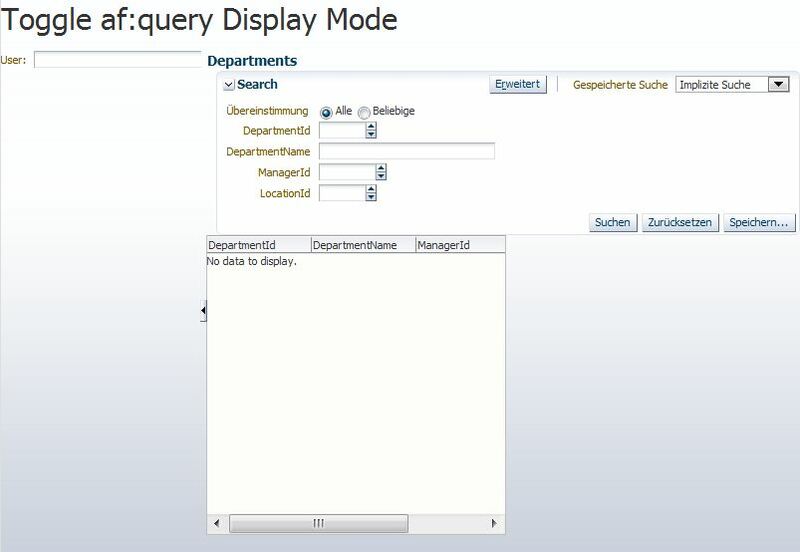 Use Case: lets assume we want to show an af:query panel in advanced mode to only a specific user named ‘King’. 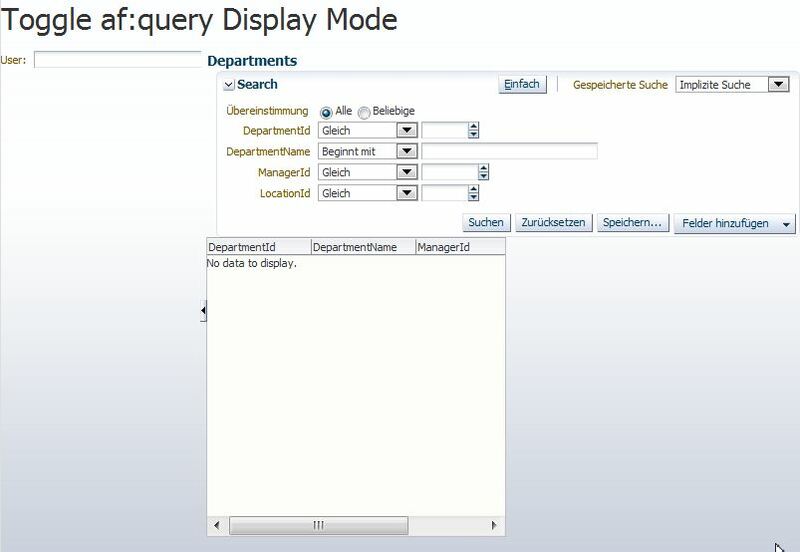 All other users should only see the ‘basic’ af:query panel. For this we use an inputText on the left side of a af:panelSplitter which is used to input the user name. When the value of this inputText changes we check if the name is ‘King’ and switch the af:query to ‘advanced’ mode, otherwise we set it to ‘basic’. To implement the use case we have to do two things. First we need an inputText to enter the user name. In reality this name should be get from a security context. 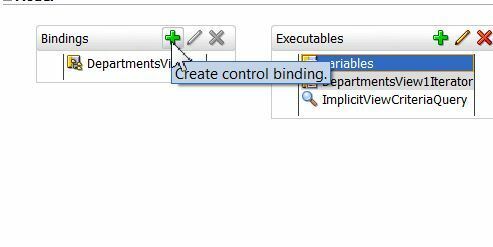 Here it’s enough to store the value entered by the user to a binding attribute, set the inputText component to autoSubmit and implement a valuechangeListener where we put the logic to switch the mode of the af:query to ‘advanced’ or to ‘basic’. The af:queryPanel is bound to a bean property in the BTAFQBean for convenience. This makes it easy to get the component and sent it a PPR from java code. The essential part of the code is located in line 12 and 20. 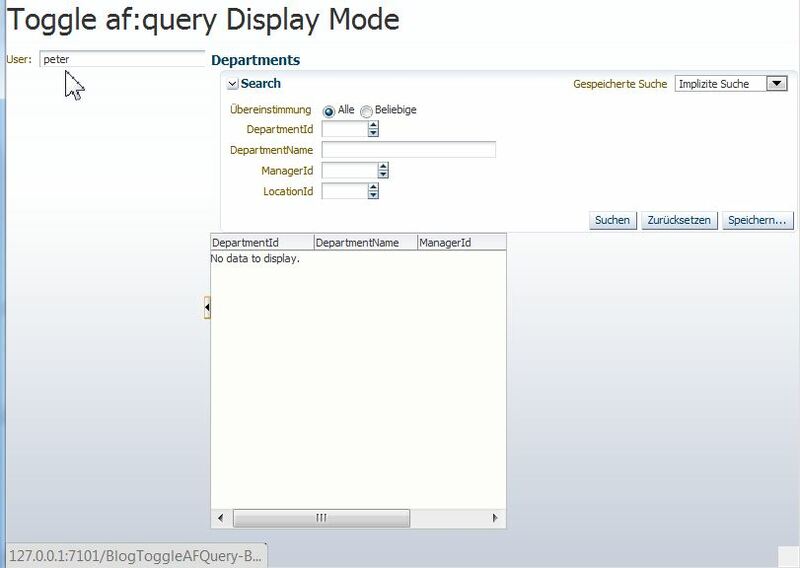 The method to switch the mode is hidden in the query descriptor which you get as the value of the af:query component. gp.getValue() get us the QueryDescriptor which exposes the changeMode() method. The parameter is a constant, either QueryDescriptor.QueryMode.BASIC or QueryDescriptor.QueryMode.ADVANCED.